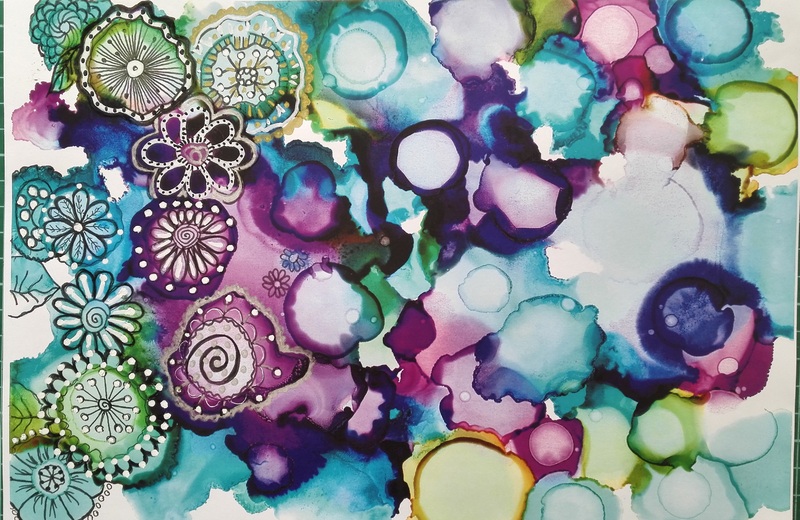 This entry was posted in Creations From My Craft Room and tagged alcohol inks, doodles, inky doodles, Note-Cards, yupo paper by thecontentedcrafter. Bookmark the permalink. The cards are all fabulous, Pauline. Your decision to sell without envelopes seems very sensible. You are so amazingly talented, Pauline! I love sixties inspired prints. All of them are so gorgeous that I would never be able to choose a favorite. Those shipping costs are crazy, I was thinking that shipping on ebay round the world is fairly reasonable, but I guess I never order from Australia. I hate that it costs so. Much love to precious Siddy! I’ve just seen this comment Lana, which means you didn’t go in the draw – so very sorry about that! The ‘no-envelopes’ option makes it affordable which is a bit crazy huh? Shipping costs just keep going up and up, I guess it makes us buy locally though. Oh, that’s okay, Pauline. I get behind on my blogging at times. Shipping costs do seem to be a bit of a challenge. I was considering opening an Etsy store for my beaded jewelry, but have too many things going on to do it right now. I don’t know about the future, the shipping may prohibit making that possible. You are still busy moving Kym? It’s a horrid job isn’t it, even when you want to do it….. thanks for taking the time to pop in with your thoughts, it’s appreciated. And no, you are not too late. So beautiful, hard to choose but I think I like Cranberry Street and Evening Garden. I was so impressed with this technique after you posted that I looked online for this paper. That’s about as far as it went. I think the shipping costs with the envelope would just be too difficult. Surely I could fashion my own envelope, not sure. I save a lot of envelope so I usually have something around here that fits. I also like the idea of more of a postcard with no envelope needed. Could also be framed as a wall hanging. I am so blown away with your talent. How are your textiles doing? You have just given me a good idea Jan! I will put up a post showing how I make an envelope to fit an odd sized card, it’s pretty easy. As for the textiles, I updated that post recently to tell that story………..
Love the art work and of course I love little Siddy. He is such a happy little fellow. The postage costs of the cards is a bit of a hard spot. I agree with others that perhaps selling just the cards sans envelopes is the best with an aside to US customer that the cards and envelopes come together. 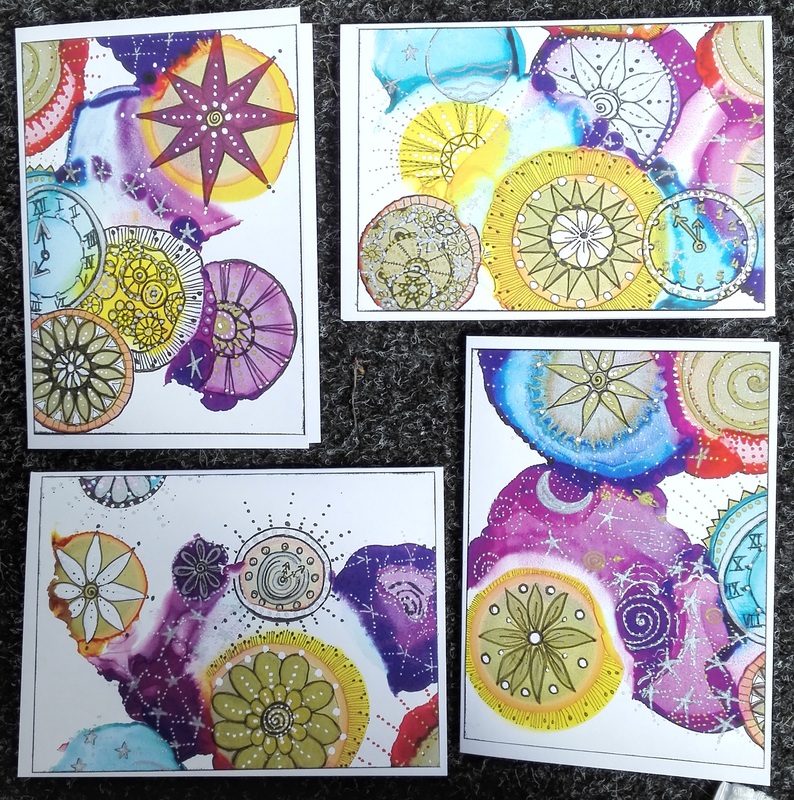 Have you thought of just publishing the art work without making it into a card? I buy cards where I like the art work and then frame them as prints, not using them as cards. I could see the cards as groups of art work in frame on a wall. I have been persuaded that the offer of envelopes or no envelopes has to be made to suit customers needs. It gets quite complex doesn’t it – it is so good to have everyone’s perspectives! First things first – Great to see Siddy up so close to the camera. I can feel the love coming from him. Give him the biggest of hugs from me. As for cards – Can you not set an option for each? So those folks who want envelopes can pay for them and their associated postage and those who don’t don’t have to. If I was lucky enough to have my name pulled from the draw, I’d say close your eyes and pick one for me. They are all gorgeous! Well done! Your art speaks to me, Pauline. 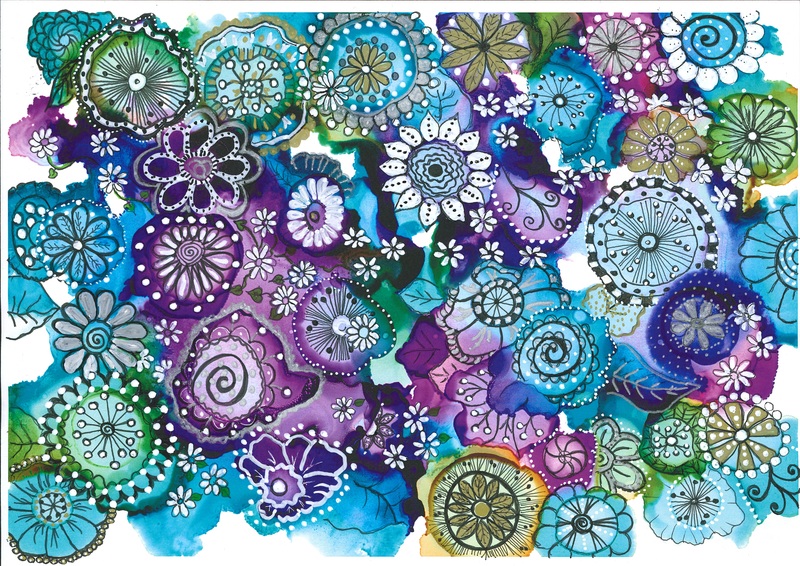 The ink blots alone are stunning, but then the overlay of your incredible doodles. I wish I could do that! They’re stunning one and all. 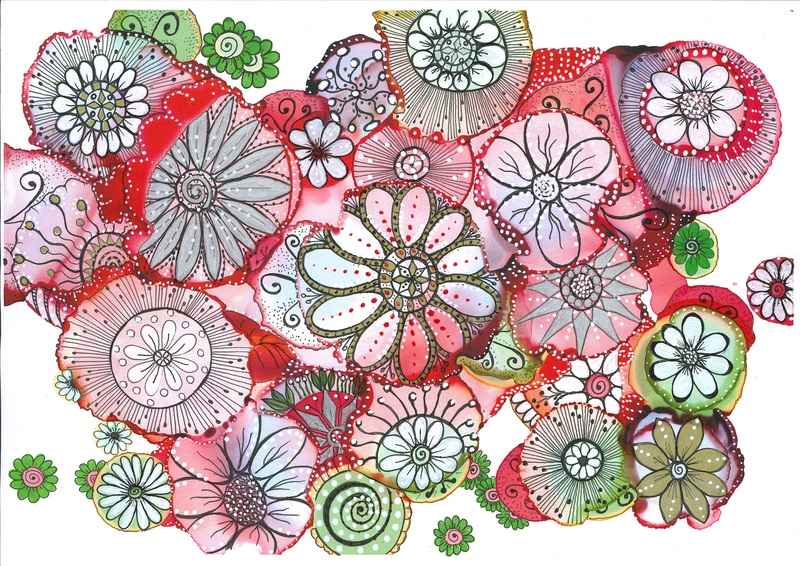 I think I would like an “Evening Garden” bedspread….or a summer dress. They’re lovely. Did you look into Spoonflower? Perhaps you are good and fed up at this point. 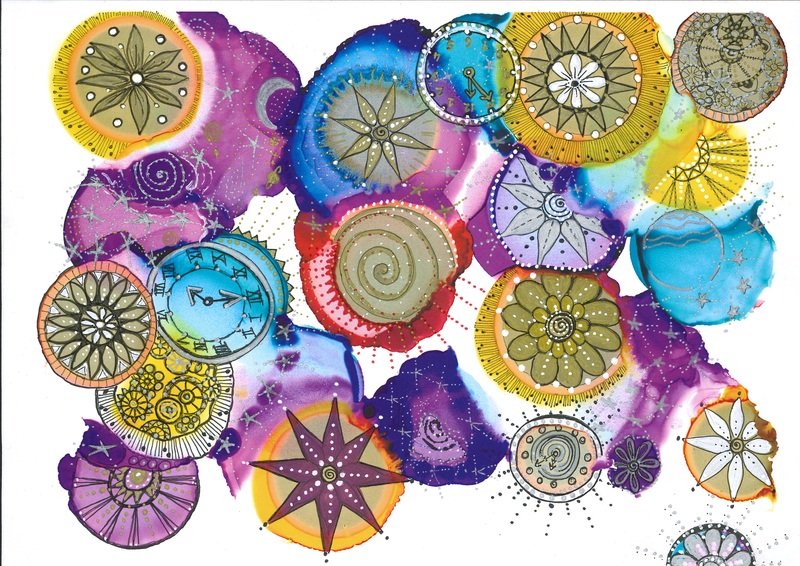 Cosmic time by a country mile Ms Pauline. You are incredibly talented. Lovely work :). Also, I have an artist lady in my film class this year who reminds me SO much of you! She even looks like you. I keep calling her “Pauline” when her name is Georgie (blush). 😀 I think Georgie is a much nicer name than Pauline! Perhaps we could swap and no-one would notice? Does she look like Kate Bush too? That’s my favourite too -Cosmic Time – but I already said that…. Love, love love these. Especially Cosmic and Evening Garden. My colours. We don’t need envelopes, they are ten a penny in Smith’s here. What we can’t get are your lovely cards. Thanks for your enthusiastic response Jenny 🙂 Good to know! I guess cost dictates and… often I’d have a spare envelope and a recycling label to cover any old info or I’d include the card in something else – a present for instance. Selling cards individually then I think an envelope is needed but a book of cards, as it were, could well come without. That’s a nice thoughtful comment Geoff – thank you! I choose the one of each option. I love them all. Here’s the thing – why do you have to sell in sets of four? What would the shipping costs be on singles and doubles? Would you save money if you shipped cards and envelopes in different packages? I agree with Kerry Can – it would be great if you could find a local outlet – or at least a NZ outlet. Also, have you thought about scanning the completed doodles so that you could print them and use them over and over? 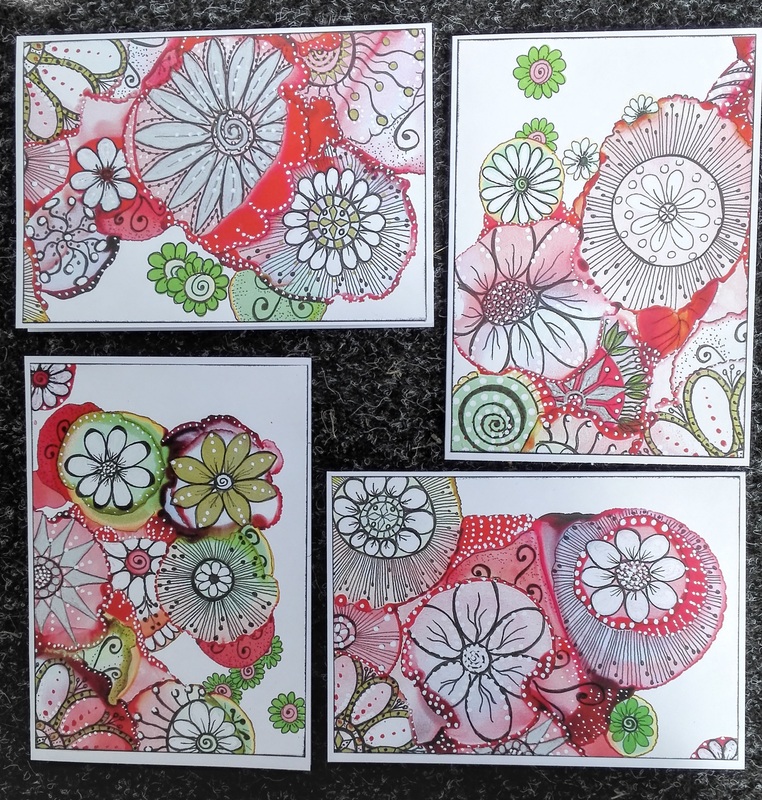 It would not be the same quality of course, but it MIGHT be a way to make the cards less time consuming, and therefore you could offer them less expensively. 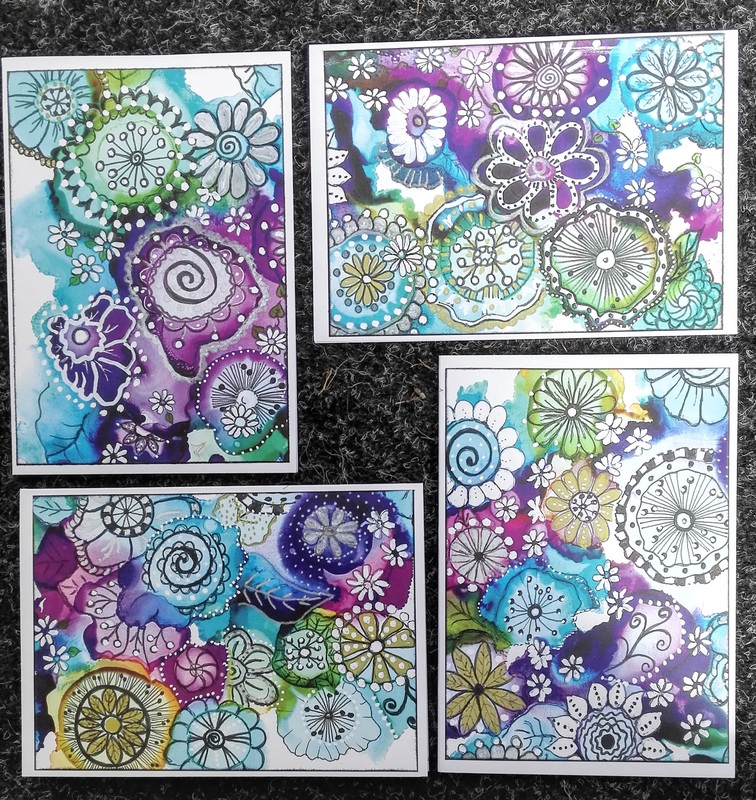 I have done that with some of my cards – I create the art, scan it and reproduce it so I can 1.) recreate the exact thing, and 2.) make the time investment in the original worth the effort. All ideas, but only you know what works for you. Best of luck selling these treasures! Good questions Salpal. The cost would be the same for one as it is for four. They are in sets of 4 as that is what comes from one sheet, otherwise I get into which particular quarter of the A4 sheet do you want……… that would drive me bonkers. If I shipped cards and envelopes in different packages you would end up paying $3 for the cards and $15 for the envelopes as they are slightly over size and fall into the small package department as decided by the post office. So then we are back to putting them both together and saving that first mentioned $3 but paying $15 for shipping. Yes, I have scanned and copied the finished product. The cost for a commercially produced card here is at least $6 and up to $15 unless you buy the really tatty mass produced packs of six which are about half the size and the same price I am asking for one of my hand made cards. It’s crazy isn’t it. I will keep on thinking of ways… and let you know if I get a brainstorm. I like Cosmic Time and Evening Garden best–but, really, they are all so great and fun! I love everything you make but I might like these cards best of all! And Siddy, of course. Can you find a local market where you could offer these for sale? To get around the crazy shipping costs? I think people would snap them up! I’m miles away and can’t possibly join in the fun of the give away. But carnaby street and summer garden won my heart! Waving hi to Siddy too! Goodness thanks Pauline. Shipping costs here is madness. I do not suggest friends sending me anything. Most often, the package is hijacked in the post office, other times I have to pay produce a receipt of the things inside the package and the shipping fee. It is a nightmare that’s why I don’t encourage it anymore. 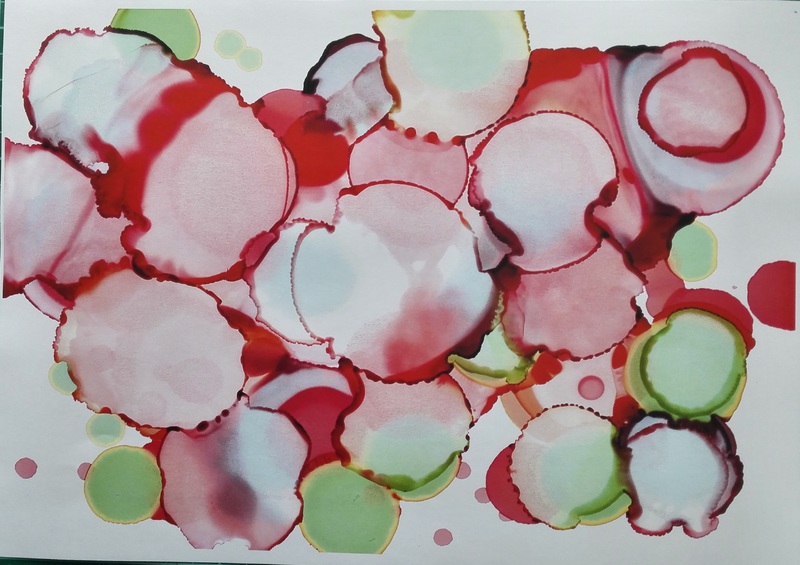 Just last year, I won postcards from an artist from Australia in Colour Me Positive’s week 18. My heart sank when I was instructed to pay for the contents of the package and the shipping fee and also to produce a receipt. Unfortunately, I was not able to get the 4 postcards. What happened was so depressing to think that I won those cards. That’s a great solution, Pauline. I’d like to share this with you too how I get my imported art supplies. One solution is to really save up on them until they are available here. Second is to order them online and have them shipped to my sister in law in the US which she then sends me once the balikbayan box is full. Third option is to order online and shipped to my cousin’s Aunt and she brings them home every other year. Fourth option is to order them locally through a bookstore or an online local art store and shipped to them which takes about 2-4 months. I usually do that fourth option with my books and the first option with the art supplies. Art is booming here but the supplies are so expensive and luckily saving up on what I really want is still a great solution. Supplies here are expensive too Carrie, but it isn’t difficult to have them sent in. So you have to think a way ahead for your supplies, which one can get used to doing. Is it then an option to enter your name in giveaways and have the gift sent to your choice of relative to deliver at an appropriate time? Yes, that’s what I always tell the giver if ever I won in his/her giveaways. If the giver is in the US, I ask the gift to be shipped to my sister in law. If its in Canada, to my sister. If around Asia, to my cousin in Singapore. Isn’t he just gorgeous! I just adore the wee fellow, he makes my day every day! I can’t tell you how much I love that you want a Siddy too! ❤ He would bring so much happiness into your home and change you in ways you wouldn't have thought possible 🙂 Look for the one that chooses you – that's the secret! Good to know, thanks Derrick! I was going to go for Carnaby Street until I saw the last choice with one of each. They’re all so wonderful and that would mean I wouldn’t have to choose. Are the required envelopes a standard size? If people are able to buy their own at home, the cards without envelopes are certainly the better option. Postage costs are ridiculous here too. The minimum cost for international mail is $17 and that’s up to just 200 grams. It’s crazy. Especially when we learned on the news last week that the CEO of Australia Post earns $5 million a year – ten times as much as our Prime Minister. Hi Carol, yes the cards are A6, the most common size of greeting card. I’m pretty sure you can pick up the envelopes for very little anywhere in the world. The world of corporate incomes is a most odd affair isn’t it. But then again incomes in general have never had much to do with the worth of people’s work or contribution to the good of the world! On a completely different topic, are you safe from the fires around Christchurch? Yes, five hours south in Dunedin. No chance of fires here, it has hardly stopped raining all ‘summer’. Our poor Christchurch – the city and our friends, they just keep getting battered! I thought you were closer. Thank goodness all is well where you are. It’s sad to see what is happening there. It is! The people of Christchurch have had a lot to bear in the past few years. I love all the cards, but especially the Evening Garden. 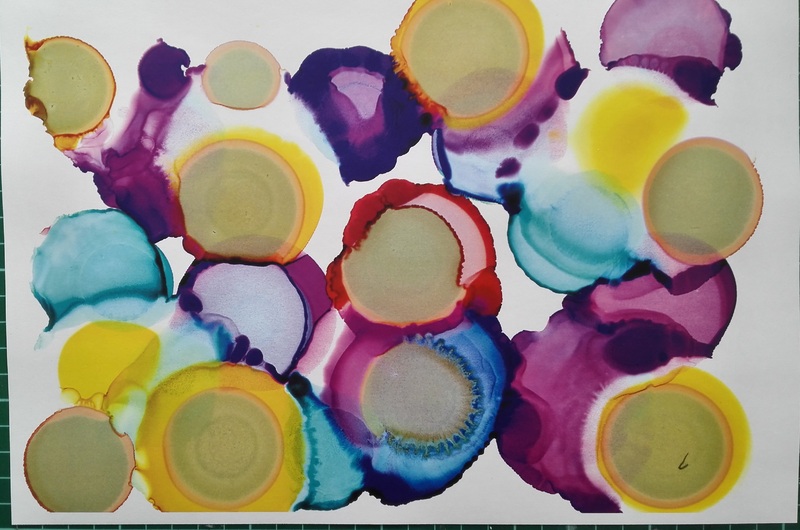 I would love to have a go at this technique – although not being an artist I have no idea what ‘yupo paper’ even is. I will have to return to your original post to check what else I might need… paper and ink is not a familiar combination to me for anything other than letter-writing. 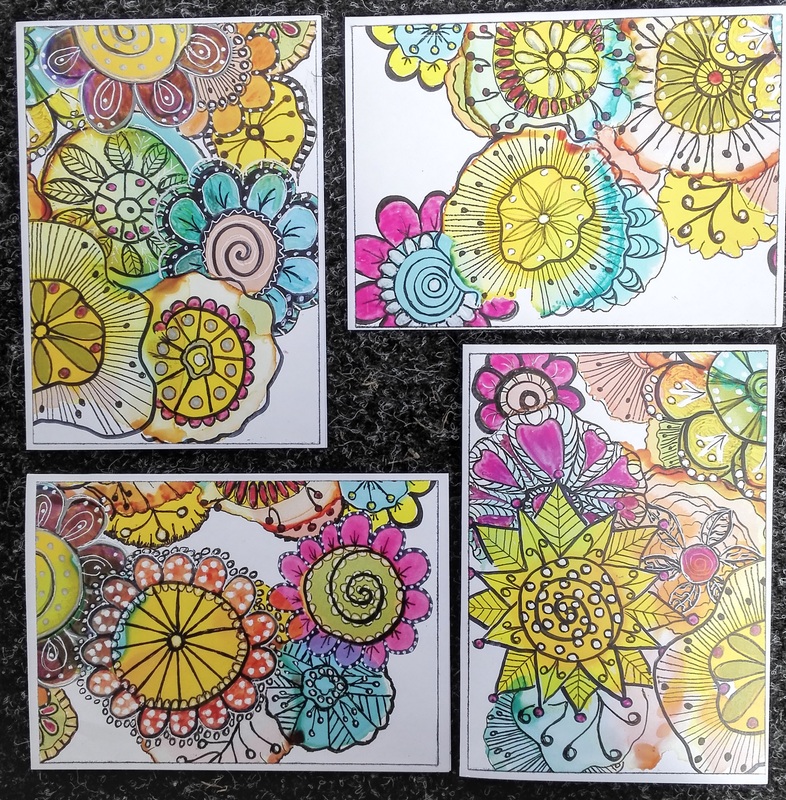 I’ve looked up the materials – yes a bit pricey, but I’d like to have a go… and then (if good enough) use the finished art to make some of Wild Daffodil’s never ending cards. What sort of black pen do you use for the doodling? Right… later on I will order some supplies… I never do art on paper, but I am really inspired to try this. Oh my goodness, there isn’t anything here I don’t love! Including the beautiful image of a freshly groomed Siddy. He is just too adorable. I’m just so excited for you. You deserve so much good in your life. They’re all very pretty but Evening Garden is my favourite Pauline. A beautiful combination of colours.